The term 'all-in-one system' is becoming more and more ambitious as more bits and bobs come to be considered standard parts of a system. With the RCX-1500, Rotel has arguably enlarged the envelope compared with previous products we've encountered under that general heading. The obvious bits are there – CD player; DAB and FM radio; amplifier; line input and a couple of digital ones – but the RCX-1500 goes a lot further. Indeed, thanks to the awesome power of the internet, it goes almost infinitely far. The 'killer feature' here is the inclusion of internet connectivity (usually wireless, though you can cable it up to your router if you prefer) and Rotel has gone to some lengths to make this a very flexible way of accessing music, with value-added bits tagged on along the way. Internet radio is truly one of the wonders of the age. Where FM is theoretically capable of accessing a few dozen stations in a given location and DAB can manage a hundred or more, internet radio currently offers something in the region of 15,000 of them. At least, that's the official figure. A few are only part-time, some never seem to be accessible and for copyright reasons some are supposed only to be available from certain geographical locations. But even if as many as half are ruled out on those grounds and half of the remainder are excluded on grounds of abominable sound quality (and there is certainly some of that out there, sorry to say), that still leaves more stations than you are likely to browse through in an evening or two, especially as more are being added every week. Obviously this all assumes you're in an internet-enabled household and if you're not, you don't want an RCX-1500. We couldn't actually get it to do anything other than play CDs until we had got its internet connection set up and that caused us to spot one of the unit's (few) operational weaknesses: it needs a 'dongle' to be plugged in at the rear to access wireless computer connections. The dongle is supplied, but one might not spot it at first. On turning on, the unit doesn't seem to realise that the dongle is missing, but just gives error messages about finding no network. Surely a message like 'insert dongle' or 'connect to computer' or something equally helpful could be displayed? While we're in critical mode, we might mention the rather plain display, which carries four lines of nice clear text, but doesn't make for the most obvious navigation of, well, anything, really. The front panel buttons aren't bad and the remote helps, but again isn't quite the best we've seen. In particular, finding the station one wants, from the however-many-thousand available by the time you read this, can be tricky. But – and this really is a pretty big 'but' – Rotel has been rather clever and largely pre-empted this problem. In the instructions is a pointer to Rotel's own internet radio website (connected with Reciva, the de-facto homepage for internet radio in general), where one can register one's RCX-1500 and also select stations to add to the list of 'My Stuff' which the RCX-1500 itself accesses when it connects to the internet. This effectively populates a list of preset radio stations, with the operational ease that comes from a desktop or laptop computer and all the features of a full-on Reciva web page. In addition, via the Rotel radio page, one can store music online for easy listening, compile 'custom radio stations' playing music of a style one likes and more, all thanks to various online music services that clever folks have dreamed up. No doubt more will come. Now if a bit of hi-fi is connected to the internet via a router it's effectively also connected to your home computer(s). They probably have some music on them, in iTunes in some folder on the drive. If you have a recent version of a media player on a computer that's compatible with 'uPnP' and file sharing is enabled, the RCX-1500 can access and play music on the computer. Amusingly, our review sample picked up that we had PURE Digital's 'PureServer' installed on our local PC and so was able to play music via that before we'd even got round to checking if our copy of Windows Media Player was up-to-date and the correct version. This is a pretty powerful feature, giving as it does access to all the files one might have downloaded or ripped from CD. And the good news is, that it supports practically all conceivable file formats. Of course, the inevitable MP3 and WMA are there, plus AAC, but much more impressively so are FLAC, WAV and AIFF, meaning that you can enjoy full-quality sound, at least to CD standards from your computer. All that's required is for the computer to be turned on. We even got a 96kHz-sampled track to play, though it wasn't entirely stable. Still, uncompressed 16-bit/44kHz audio over wireless is not to be sneezed at. Not enough for you? There's a USB socket on the front of the RCX-1500, for USB sticks and so on, but in the most modern manner it also supports iPods. Yes, this is a fully digital iPod dock, transforming your iPod into another kind of 'bit bucket'. All the file formats we could think of to try are supported, so again you can have full-CD-format audio, pure and uncompromised. The Rotel's transport controls or those on the iPod than be used. In practical terms, all this is achieved in a unit which is actually a little narrower than most current hi-fi, about the height of a powerful integrated amp and just a little deeper than most of that breed, if one includes the dongle in the measurement. It has a conventional linear power supply but sports a switching power amplifier, feeding a single pair of speaker terminals at the rear. There's a preamp output for feeding a remote amp. The CD transport is a slot-loader – a bit slow and mechanically noisy – and not the greatest glory of the unit, but it functions just fine. Component quality is decent, with a high-spec Wolfson DAC chip included. With so many options on hand, it seems easiest to fall back on an old favourite – and a comfortably known quantity – and listen first to a few CDs. 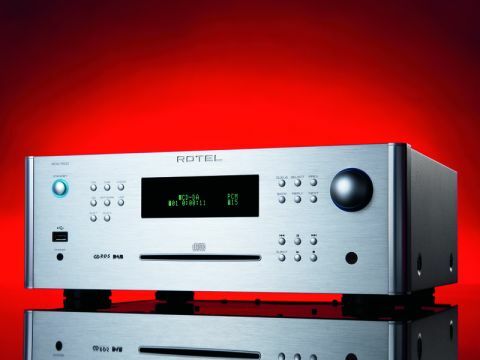 Rotel, of course, has made some very fine CD players and amps in its time and we hoped some of them would prove to have rubbed off on this unit. In fairness, it's not fully up to the standards of the best, sounding a little closed-in at times. But it's a little hard to know where to set the benchmark, in terms of price: how much of that £1,195 should one allow for the DAB, FM, internet and USB-input stuff? If one judges this as about £700-worth of CD player and amp then it's actually very decent. Like quite a lot of switching power amps we've heard, it presents energetic and rhythmic music, with a very likeable bass, which may not always be the most incisive but always sounds plausible. There's good detail across the midband and what little coloration we could find is really nothing more than a slight accentuation of the lower midband. Treble is where the RCX-1500 starts to struggle a little, lacking the crystalline purity and insight of the best separates kit, but again it's never less than listenable. It's a little pointless talking about the sound of DAB and internet radio: being quite heavily data-compressed, they tend to dominate the performance of most replay equipment of this kind. The FM receiver is OK, though not vastly exciting, with a rather rough sound even under near-perfect reception conditions. With an internal wire antenna it really struggles and we imagine it's intended as little more than a fall-back. The optical and electrical digital inputs are good, if not amazing and the USB input definitely adds quality to sounds stored on portable players. And then the 'Network' input, which means music on your computer, is also a clear improvement on most ways of connecting a computer to a hi-fi. No, it doesn't sound as good as the best of the USB-input DACs available, but it sounds an enormous amount better than the analogue output of a normal computer (or even a respectable soundcard). And it's wireless! There is still no single, perfect way to play all music sources under all circumstances, for all users. And this is fast becoming something of a Holy Grail for forward-thinking audio companies, as we shift towards non-physical media on drives. For some, a laptop computer with a USB-connected DAC may still tick more boxes than this unit. But for those who prefer the straightforward look of a bit of 'real hi-fi', or who prefer a desktop computer to a laptop, the Rotel is one thoroughly accomplished and very neat way of doing practically everything a computer does without actually being a (normal) computer.